NETWORK FINALS: The NCIS: LA rerun fell 0.1 in final numbers. CABLE HIGHLIGHTS: HBO’s original film THE IMMORTAL LIFE OF HENRIETTA LACKS premiered at a lackluster 0.22. The NBA PLAYOFFS and related programming owned the Top 5 slots on Saturday cable, with games split between primetime on ESPN (1.85/1.30, led by Golden State vs. Portland) and afternoon on TNT (0.95/0.77, led by Washington vs. Atlanta). Off the court, Adult Swim was once again in charge, and its line-up performed as follows: SAMURAI JACK up 0.02 to 0.68, DRAGON BALL Z up 0.05 to 0.50 (the primetime edition was up 0.05 to 0.40), ATTACK ON TITAN at 0.41, TOKYO GHOUL at 0.35, HUNTER X HUNTER down a tick to 0.32/659K, MOBILE SUIT GUNDAM up a tick to 0.27, NARUTO down 0.02 to 0.26/547K, and GHOST IN THE SHELL down 0.02 to 0.23/487K. 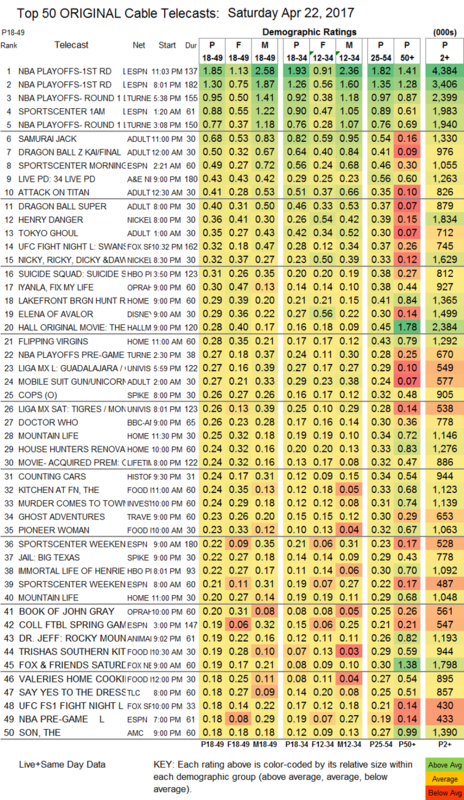 A&E’s LIVE PD was steady at 0.43. Nickelodeon’s primetime HENRY DANGER rose 0.07 to 0.36, and lead-out NICKY, RICKY, DICKY & DAWN was up 0.06 to 0.32. Fox Sports 1’s UFC FIGHT NIGHT was at 0.32. On OWN, IYANLA FIX MY LIFE gained 0.07 to 0.30, and THE BOOK OF JOHN GRAY was up 0.06 to 0.20. Disney Channel’s 9AM ELENA OF AVALOR was at 0.29. Hallmark’s original movie THE PERFECT CATCH was at 0.28. On Spike, COPS ticked down to 0.26, and JAIL BIG TEXAS was steady at 0.22. On BBCAmerica, DOCTOR WHO fell 0.06 to 0.26, and CLASS tumbled 0.11 to 0.08. Lifetime’s original movie THE OTHER MOTHER was at 0.24. On History, COUNTING CARS was at 0.24, compared to last week’s 0.25/0.24. On Food Network, KITCHEN AT FN ticked up to 0.23, PIONEER WOMAN lost 0.03 to 0.23, TRISHA’S SOUTHERN KITCHEN was at 0.19, and VALERIE’S HOME COOKING was up 0.02 to 0.18. TLC’s SAY YES TO THE DRESS slipped 0.03 to 0.18. AMC’s THE SON ticked up to 0.18, and the Sundance simulcast was at 0.02/175K.